This entry presents the empirical research on the slow rise of democratic regimes over the last two centuries. Democracies are distinct from autocratic countries in which political preferences cannot be expressed and citizens are not guaranteed civil liberties. Anocracies – a term used often in this entry – are regimes that fall in the middle of the spectrum of autocracies and democracies. Anocracies are countries which are not fully autocratic, but which can also not be called democratic. The majority of the world&apos;s countries are now governed by democratic regimes, defined as systems with citizen political participation, constraints on the power of the executive, and a guarantee of civil liberties. The visualization below shows the slow increase of democratic countries over the last 200 years. The rise of democracies has been interrupted by the atrocities during the two World Wars – many young democracies fell back to become autocratic ahead of the Second World War. After 1945 the number of democracies has started to grow again, but the very dramatic shift towards a democratic world has been the breakdown of the Soviet Union in 1989. By clicking on &apos;Autocracies&apos; and &apos;Anocracies&apos;, you can also see that after 1989 the number of autocracies has decreased dramatically while the number of anocracies initially increased then has stayed fairly stable. The mere number of democratic countries does not us how many people in the world actually enjoy democratic rights since the population in different countries varies hugely. Therefore it is more interesting to look at the number of people governed by different political regimes. This is shown in the chart below. By clicking on &apos;Relative&apos;, the following graph shows the share of people living in different regimes over the last two centuries. The chart shows the share of people living under different types of political regimes over the last 2 centuries. Throughout the 19th century more than a third of the population lived in in countries that were colonized by imperial powers and almost everyone else lived in autocratically ruled countries. The first expansion of political freedom from the late 19th century onward was crushed by the rise of authoritarian regimes that in many countries took their place in the time leading up to the Second World War. We see the same data on political regimes on the map below, but it is worth pointing out that 4 out of 5 people in the world that live in an autocracy live in China. The world has changed: 2 centuries ago most countries were autocratically ruled or part of a colonial empire, today most countries are democracies. The map below shows the data for 2015, but you can move the slider at the bottom past to see this change over the last 2 centuries. Most countries in Europe and the Americas have become democracies. Some parts of Africa - especially in the West and the South - have democratized and so have countries in Asia; India is the world&apos;s largest democracy. Australia, New Zealand, Japan and Mongolia are all full democracies according to the Polity IV evaluation. The following world map of the age of democratic regimes shows that a democratic world is only a very recent achievement. It also indicates that economic success goes together with political liberation. The countries that have democratized first are mostly those countries that first achieved economic growth. The present rates of economic growth in the poorer countries of the world therefore give hope for further democratization around the world. Below we will analyse what causes a country to turn democratic and vice versa what consequences democratisation has for the living conditions in the country. But first I want to show how democratic countries differ from non-democratic countries. The scatter plot below shows the latest observations for GDP per capita and the Polity IV score. No country that is an autocracy (score between -10 and -6) has an income of more than 15,000 international-$ if it is not heavily dependent on fossil-fuel exports. Countries that are autocratically ruled and do not have the option to export fossil fuels are poor. As a measure for the health situation in a country I am looking at child mortality. What we can see from the scatter plot below is that autocratic countries rarely have a healthy population. Few autocratic countries achieved a child mortality below 10 per 1,000. Democratic countries – Polity score of 7 or higher – on the other hand often have child mortality rates below 10 or even 5 per 1,000. This cross section at one point in time does not tell us anything about the length of time that a country was ruled by a democratic government – for this we have to study the link between democratisation and health in more detail and more carefully. It is difficult to identify what causes countries to turn democratic and vice versa that is investigating how living conditions change in countries that turn democratic. The reason why social science gets so very difficult is that all good things tend to come together. We have just seen that in the preceding correlates section – democratic countries are richer, healthier, happier, better educated and more. This means that if we study measures of all these aspects across countries we find a correlation between all of them; social scientists therefore use clever methods when trying to distinguish between correlation and causation. Under this hypothesis, therefore, we should expect that education levels in a country correlate positively with measures of democratisation in subsequent years. The following visualization shows that this positive correlation is indeed supported by the data. As we can see, countries where adults had a higher average education level in 1970, are also more likely to have democratic political regimes today (you can read more about measures of education level in our entry on Global Rise of Education). However, the academic research here does suggest that there is a causal link between education and democratization – indeed, a number of empirical academic papers have found that this positive relationship remains after controlling for many other country characteristics (see, for example, Lutz, Crespo-Cuaresma, and Abbasi‐Shavazi 20103). In considering the link between the type of political regime and the protection of human rights it is important to note that the right to vote on those in political power is in itself a fundamental right. In this sense democratic countries are by definition those countries in which this important dimension of human rights is protected. But there are several human rights and it is interesting to study the link between democracy and these. As we note in our entry on human rights it is however very difficult to measure human rights protections consistently. The best available human rights measure is the protection score published by political scientist Christopher J. Fariss in Farriss (2014)4. This measure focusses on the protection of the physical integrity of citizens and captures whether a government protects the physical integrity of its citizens and takes into account torture, government killing, political imprisonment, extrajudicial executions, mass killings and disappearances. Higher human rights scores indicate better human rights protection. The visualisation below plots the regime type – again captured by the Polity IV measure as before – against this human rights protection score. Political regime scores of 6 and above indicate a democratic regime and we see from this chart that citizens of non-democratic countries have generally much lower chances of being governed by a regime that ensures the protection of human rights in this dimension. With the exception of two countries – Singapore and Oman – all countries that have human rights score of higher than 0.5 are democratic regimes. Mulligan, Gil, and Sala-i-Martin (2004)5 investigate the link between democratic rule and the protection of human rights in a sample of 121 counties controlling for other important variables. The authors find that relative to autocratic regimes countries that are democratically ruled are less likely to execute, regulate religion, and to censor the press. Does democratisation have an effect on education? It is not straightforward to identify the possible effect of a democratic regime on the expansion of education because it has to be distinguished from the previously discussed reverse causation running from education to democracy. Also, Acemoglu, Naidu, Restrepo, and Robinson (2015)10 find that democracy is associated with an increase in secondary schooling. Harding and Stasavage (2014)11 equally identify an impact of democracy on primary education. The explanation the authors propose is that electoral competition in democracies increases the incentives for politicians to abolish primary school fees. The authors caution that democratisation has a much small effect on the provision of school inputs and consequently the quality of schooling, because executive actions on these issues are more difficult to monitor and therefore constitute a smaller advantage to politicians in electoral competition. In an earlier paper Stasvage (2005)12 focussed on Africa and finds that the shift to multiparty competition in African countries in the 1990s increased total educational spending as a percentage of GDP. In an extensive study of 100 countries over 40 years Ansell (2010)13 presents evidence that democratisation increases both total educational spending as a share of GDP and as a share of the government budget. Naidu (2011)14 studies the effect of the 19th century disenfranchisement of black citizens in the U.S. South through poll taxes and literacy tests. The author finds that this reversal of democracy "reduced the teacher-child ratio in black schools by 10-23%, with no significant effects on white teacher-child ratios". Martinez-Bravo et al. (2012)15 study the gradual introduction of local elections in China. The authors exploit the staggered timing of the introduction of village elections as a natural experiment for causal identification. The authors "find that elections significantly increase public goods expenditure, the increase corresponds to demand and is paralleled by an increase in public goods provision and local taxes" confirming some of the results elsewhere in this entry including increased public education in villages with more children. The increase in public expenditures – overall total public goods investment increased by 27 percent – is funded by villagers and is accompanied by an increase in the amount of local taxes paid by villagers. The introduction of elections also reduced inequality by redistributing from the rich to the poor partly through land redistribution from elite-controlled enterprises to household farmland and improved agricultural productivity by increasing irrigation which is likely to "disproportionately benefit poorer households". Additionally the authors report that following the introduction of elections the turnover of village chairmen increased and their characteristics changed. They are less likely to be Communist Party members and the politcians are importantly better educated themselves. It is necessarily controversial to measure a complex concept such as the type of a political regime in a single metric. But since it can be useful to quantify the political regime characteristics so that it is possible to compare political regimes over time and between countries and to study the drivers and consequences of political regime change quantitatively. For example a field of study where this can be useful is studying the link between democratisation and the end of mass famines. A much cited, thorough evaluation of commonly used democracy measures has been presented by Munck and Verkuilen (2002).16 Unfortunately the authors find a trade-off between the comprehensiveness of the empirical scope and the quality of the assessment in terms of conceptualization, measurement and aggregation. According to the authors, the Polity IV measures are a &apos;partial exception&apos; of this tradeoff, and therefore I rely on these measures mostly in this entry. In general, the Polity IV defines democracy as a system which has institutions in which citizens can express their preferences, has constraints on the power of the executive, and a guarantee of civil liberties. It defines an autocracy as a system that restricts political participation by citizens, has executives chosen within the political elite, and executives with few institutional constraints. The Polity IV measure used here is certainly also questionable – as would every other alternative – but we chose it as my main source because based on our comparison with alternatives and the paper by Munck and Verkuilen (2002) it is the best available option, particularly if a long-run perspective is the main objective. We also have to keep in mind that this measure cannot capture everything that matters for a political regime. For example it makes sense to measure corruption or human rights separately from the democracy concept. Not because it doesn&apos;t matter but because all aspects matter and for different question we want to be able to differentiate between the importance of different factors. Particularly good about the Polity IV measures is that the data source has a detailed explanation for each country why a country was classified in a particular way in a particular year: You find these country by country explanations in the pdf files here. 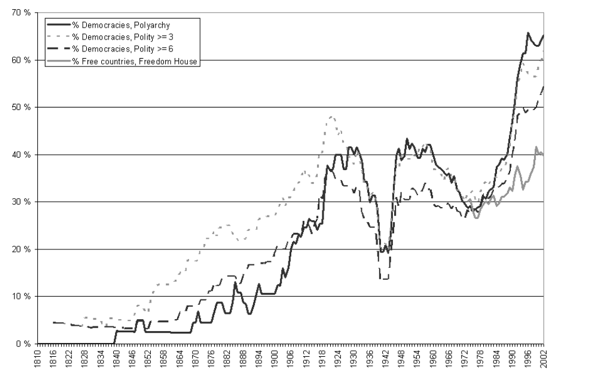 This graph compares the political regime measures that are available for a very long time - since the early 19th century: the Polyarchy measure and the Polity measure and for a shorter period the the Freedom House measure. Shown is the share of democratic countries among all independent countries. There are some differences but the graphs shows they largely move together. An overview of measures is presented at www.democracybarometer.org and at devEconData. The Manifesto-Project by the Wissenschaftszentrum Berlin für Sozialforschung is an effort to understand political changes in democratic countries. This project undertakes a qualitative analysis of party manifestos for 50 countries since 1945. Time span: Data goes back to 1800 and is yearly updated. Available at: The website is here. Older versions of the POLITY dataset are available at Kristian Gleditsch&apos;s Polity Data Archive. This data set is compiled at Colorado State University. More comments on the Polity measures can be found at DevEconData. Available at: The data is available at Michael K. Miller&apos;s website. Data: Classification of political regimes as democracy and dictatorship (and classification of democracies as parliamentary, semi-presidential (mixed) and presidential). Geographical coverage: Global – 202 countries. Time span: From 1946 or year of independence to 2008. Available at: Online at José Antonio Cheibub&apos;s website. Papaioannou and Siourounis "Democratization and Growth"
Available at: Data and paper available for download at Papaioannou&apos;s website. Geographical coverage: Global – 206 countries. Available at: Online at www.v-dem.net. The source of the data is the polity IV dataset which is available online here. I have only included countries with a population greater than 500,000. The data is taken from the 'Boix-Miller-Rosato dichotomous coding of democracy, 1800-2007' online at Michael K. Miller’s website. The data refers to the state of the political regimes in 2007. Online without a paywall here. The following literature is largely based on Daron Acemoglu, Suresh Naidu, Pascual Restrepo, James A. Robinson (2015) – Democracy, Redistribution, and Inequality. A summary of the findings of this paper is presented by the authors here. Gallego, F.A., (2010) – Historical origins of schooling: the role of democracy and political decentralization. The Review of Economics and Statistics 92 (2), 228–243. The author employs an instrumental variable approach using historical settler mortality of Europeans and indigenous population density in 1500 as instruments for democracy. Daron Acemoglu, Suresh Naidu, Pascual Restrepo, James A. Robinson (2015) – Democracy, Redistribution, and Inequality. A summary of the results is presented by the authors here. Ansell, B., (2010) – From the Ballot to the Blackboard: The Redistributive Political Economy of Education. The dissertation is freely available online here. Published by Cambridge University Press, New York, NY. Naidu, S., (2011) – Suffrage, Schooling, and Sorting in the Post-Bellum US South. Unpublished. Available freely here. Martinez-Bravo, Monica and Padró i Miquel, Gerard and Qian, Nancy, The Effects of Democratization on Public Goods and Redistribution: Evidence from China (May 2012). CEPR Discussion Paper No. DP8975. Available at SSRN here. Munck and Verkuilen (2002) - Conceptualizing and Measuring Democracy Evaluating Alternative Indices. In Comparative Political Studies, 35, 1, 5--34. Lars Wilhelmsen - A Democratic Peace Revisited (Measuring Democracy in International Relations). Master Thesis - Department of Political Science, University of Oslo, April 2006. Online here. The Polyarchy data is available at the PRIO institute. This measure is criticized by Gleditsch and Ward (1997) – Double Take: A Reexamination of Democracy and Autocracy in Modern Polities, Journal of Conflict Resolution, 41(3): 361-383. Gerardo L. Munck and Jay Verkuilen (2002) – Conceptualizing and Measuring Democracy: Evaluating Alternative Indices. Comparative Political Studies 2002 35: 5. Online here. Carles Boix, Michael Miller and Sebastian Rosato (2012) – A Complete Data Set of Political Regimes, 1800−2007 Comparative Political Studies published online 26 November 2012. José Antonio Cheibub, Jennifer Gandhi, and James Raymond Vreeland (2010) – Democracy and Dictatorship Revisited. Public Choice, vol. 143, no. 2-1, pp. 67-101.